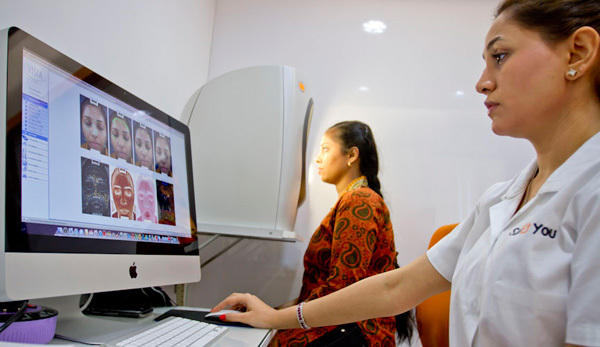 At Skin & You Clinic, Mumbai, we believe that each individual has a distinct skin type and needs. The skin analysis system use by us assists in the consultation and helps us formulate a plan just for you. Based on its assessment, skincare regimes and treatment schedules can be decided upon. It also helps us recommend products that suit your skin type. There is NO discomfort with having a computer-aided skin analysis. It generally takes just a few minutes to complete the procedure. It is helpful to all age groups – teenagers, young adults and older people. It analyzes the skin's tolerance to different therapies like laser, microdermabrasion, gel peels, injectables etc. It can also access sun damage, bacterial load, texture, surface spots, red areas, wrinkles, pores, brown spots. It is not diagnostic or a determinant for treatments but helps in providing an extensive analysis of the patient's complexion and finer variations in the skin condition. This aids the doctor in conducting an enhanced treatment-oriented consultation. Surface Spots – These spots are typically brown or red skin lesions, including freckles, acne scars and hyper pigmentation. They are distinguishable by their distinct colour and contrast from the background skin tone; they vary in size and shape. UV Spots – Occurs when melanin (pigment that gives skin its colour) is accumulated just below the skin surface as a result of sun damage. BrownSpots – These are lesions on and within the deeper layers of the skin such as hyper pigmentation, freckles, Lentigines and Melasma. They may occur from excessive melanin production (pigment that gives the skin color). Brown spots produce an uneven appearance of the skin which gets detected by the computer-aided skin analysis system. Red Areas – These can represent a variety of conditions such as acne, inflammation, Rosacea or spider veins (broken blood vessels). Wrinkles – These are folds or creases in the skin that may increase as a result of sun exposure and are associated with reduced skin elasticity (click on facial wrinkles). Texture – This is primarily an analysis of the skin smoothness and skin colour by identifying the gradation in colour from the surrounding skin tone. Pores – Open Pores on analysis of them helps determine the skin type and thus formulate an ideal skin routine. Bacterial Load – This is the evidence of bacterial load on the skin. At Skin & You Clinic, Mumbai, we believe that skin matters. Thus the skin analysis system shows us the areas of future concern and guides us in the formulation of a personalised skincare regime just for you.